December. Tis' the season. 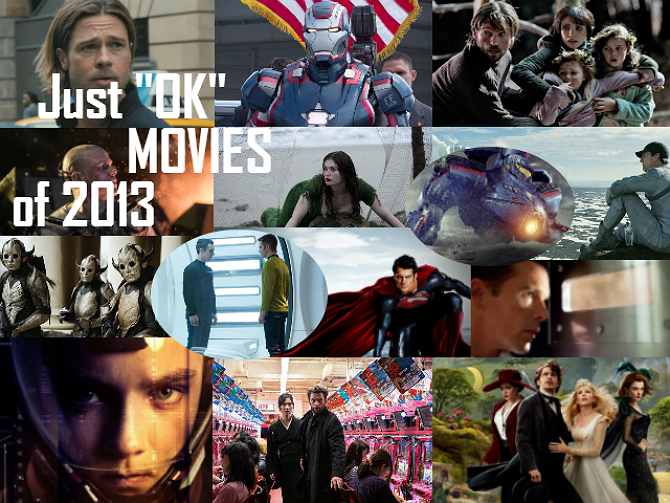 The season for the "Best, the Worst, and the just 'Ok' movies of 2013". The first week I typically highlight the Just "Ok" Scifi/Fantasy Films of 2013. The just "Ok" category is reserved for the scifi/fantasy films that weren't necessarily great, but they weren't bad either. They exist somewhere in between. These are the kind of films you watch only once, you kinda enjoy it, but you wouldn't necessarily buy the DVD. Note: For some reason there a lot of Superhero films on this list. Go figure? I have listed 15 movies that I kinda dig. I didn't love them and I didn't hate them. Feel free to agree or disagree in the comments. 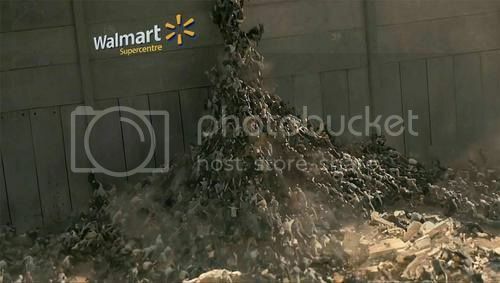 'The Purge' - My husband believes that Black Friday in North America is our version of 'The Purge.' After witnessing the insanity of Black Friday from the safety of my television, I can't say that he's wrong. I liked this film for it's unique concept. It had some flaws, but overall it was sharp, tightly written, and well paced. It's not going to be winning any awards, but it was a monster hit. 'The Purge' was filmed for a paltry $3 million and has since grossed about $90 million. Kaching! Can someone tell me why 'The Wizard of Oz' needed a prequel? I love the original 'Wizard of Oz.' Even after 75 years, the original film still shines. There are certain films that should never be "rebooted." 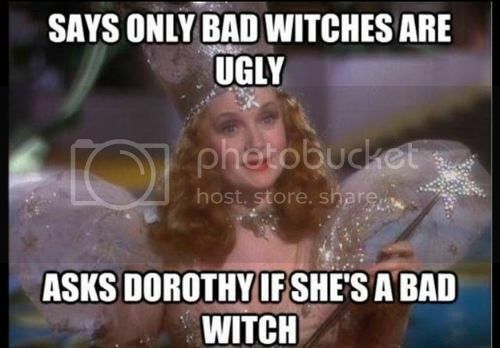 'The Wizard of Oz' is one of those films. Nevertheless, Hollywood doesn't take such heed. And despite my prejudice, this film was still fun to watch and relatively enjoyable. The effects are good, although a bit overdone. Slash Film compared the film to 'Army of Darkness' and I must say I agree. "Normal guy lands in magical land, and is forced to go on quest to save the land." It should be noted that Sam Raimi directed both films. Synopsis: A down on his luck magician named Oscar Diggs ("Oz") gets swept up to a mystical land in a hot air balloon. There he meets a naive witch named Thedora (Mila Kunis), who also just happens to be the future Wicked Witch of the West. The movie is about what happens before Dorothy lands on the Wicked Witch of the East (Rachel Weisz). 'Ender's Game' - Similar to 'World War Z,' 'Ender's Game' is based on a beloved novel. If you've read the books prepare yourself and know that the movie IS NEVER AS GOOD AS THE BOOK. It's almost a law of nature. The theatrical version of 'Ender's Game' was good, but not great. It could have been so much better. It's a bit rushed, but most movies based on books are. The best book adaption I've seen was 'The Lord of the Rings' trilogy. I've yet to see a movie match a book since. Synopsis: Set about 50 years in the future, humanity has fought two wars against an invading army of alien space bugs, called "Formics." In the books, I believe they were called "Buggers" and identified as "Formics" in later books. In preparation for a possible third invasion the Fleet creates a Battle School for children. Ender Wiggin is a trainee and the main character. Ender undergoes special training and simulations of space warfare and is quickly identified as a brilliant strategist. There is a special twist at the end, which I won't spoil. 'Byzantium' is an art house film about a traveling pair of vampires, who also happen to be mother and daughter. 'Interview with the Vampire' alum Neil Jordan returns to the vampire genre, although these vampires are very different than traditional vamps. Besides immortality, they don't appear to have any special powers. The crux of the story takes place in an abandoned hotel in a small English coastal town. The film is a little here there and everywhere, as the storyline isn't linear, and a portion of the story is told through a series of flashbacks. Mother and daughter are played by Gemma Arterton ('Clash of the Titans') and Saoirse Ronan ('Hanna'). It wasn't a complete letdown and it did have some intriguing tidbits. I had high hopes for Neil Jordan's return to the vampire genre, but this wasn't it. This is an art house film for a lazy rainy afternoon. 'Mama' is an old fashioned ghost story in the same tradition as 'The Woman in Black.' It's a solid little horror film, albeit with some weak spots. The film starts strong with a fresh concept, but ultimately it descends into utter predictability. There are a couple of thrills, but not many. Synopsis: In the wake of a family tragedy, two little girls disappear without a trace. The little girls are eventually found five years later in a feral state with little communication skills. Their Uncle Lucas (Nikolaj Coster-Waldau, 'Game of Thrones') and his girlfriend Annabel (Jessica Chastain, 'Zero Dark Thirty') take them in and try to gently civilize them. The couple gets more than they bargained for as they are haunted by an unseen force that seems to be "attached" to the girls. 'Elysium' has a thought-provoking concept that somehow got lost in translation. Neill Blomkamp (director of 'District 9') fell a bit short this time. 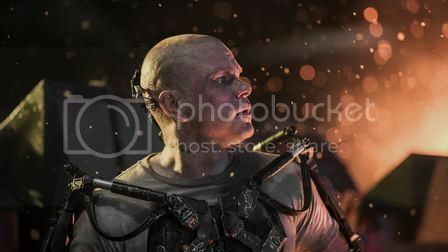 Similar to Neil Jordan and 'Byzantium,' I had high expectations for Neill Blomkamp. In my opinion, 'District 9' was the best film of 2009. Whereas 'Elysium' left much to be desired. 'Elysium' wasn't a bad movie, but it's not 'District 9' quality either. 'District 9' was a brilliant low-budget alien odyssey. 'Elysium' is a big-budget scifi melodrama. I think people (namely me) wrongfully assume that more money will make a film better. It doesn't. Still, 'Elysium' is a decent movie worth watching. Synopsis: 'Elysium' is a wealthy space station where the well-heeled and monied live in relative comfort and safety. They also receive top of the line medical treatment. The rest of society languishes in an overpopulated desolate world striped of resources. Matt Damon's character (Max) and his merry lil band are on an odyssey to get to Elysium for treatment. Jodie Foster's character (Delacourt) is trying to stop them. It's a simple tale, but it could have been so much better. Make no mistake, 'Oblivion' is a beautiful film. I remember reading that Director Joseph Kosinski wanted to bring scifi "back to the light." There are so many dark scifi films, both thematically and visually. Kosinski wanted a scifi film with bright and airy visuals, versus something like 'Blade Runner.' With that I would say Kosinski succeeded. 'Oblivion' is bright and immersive, similar to the original 1968 'Planet of the Apes' film. The problem with the film is the casting and by casting I mean Tom Cruise. I have nothing against Tom Cruise. I enjoy his 'Mission Impossible' movies. My problem is that as of late Cruise essentially plays the same character in EVERY MOVIE. Cruise is one of the most type-casted actors. If Cruise is in a film, one thing can be guaranteed, his character is a strong-willed, yet troubled man, down on his luck, who has to fight to overcome...blah, blah, blah. It doesn't leave a lot of room for creativity. Although Cruise did break the mold with his role as a rockstar in 'Rock of Ages.' So I have to give him credit where credit is due. Had 'Oblivion' cast Ryan Gosling or some other named actor, the film could have gone in a slightly different direction. If Tom Cruise is in a movie, in the end, he's always the hero. Synopsis: Earth has been decimated in an intergalactic war by aliens. Humans have retreated to the stars. Tom Cruise plays "Jack," a drone repairman working on the Planet Earth's blighted surface. Jack is mining the earth for the planet's few remaining resources. Jack's mission is almost over, when he sees some things that make him question his orders. 'Iron Man 3' - How much is too much? I like superhero films, but I wish they were more like 'The Dark Knight' and less like 'Iron Man 3.' The first 'Iron Man' was great. The franchise has descended from there. I categorize films like this as POPCORN MOVIES. Popcorn movies serve no greater purpose than to mindlessly entertain me. Yes, film making is an art form and the films on my "BEST of 2013" list should definitely be considered "ART," but most movies fall into this fair to middling category. And THAT'S OK! Entertain me while I eat popcorn and drink full calorie soda. Isn't that what movies are supposed to do? Synopsis: The events pick up shortly after Loki's failed alien invasion of New York in 'The Avengers' film. Tony Stark hasn't quite recovered yet and seems to have a form of PTSD. In this film Tony does battle with a terrorist named the Mandarin. 'World War Z' - If you read the book, then the film is a huge disappointment, but if you simply take the film at face value, it really is "OK." The film doesn't follow the book at all. I mean "at all." After reading the book, I can only think of one aspect of the film that is similar to the book. I'm not sure why the film was even titled "World War Z?," except to MAKE MONEY. Once you get past this fact, the movie isn't all that bad. Synopsis: The world has been taken over by super fast moving zombies. Brad Pitt is a United Nations liaison and is our only hope for survival. So yes, you would in deep trouble if you weren't related to him or his wife (played by Mireille Enos of 'The Killing'). Yep, that's pretty much it. 'The Wolverine' - The premise of this film is simple. Wolverine is a broken man, still haunted by the loss of Jean Grey. 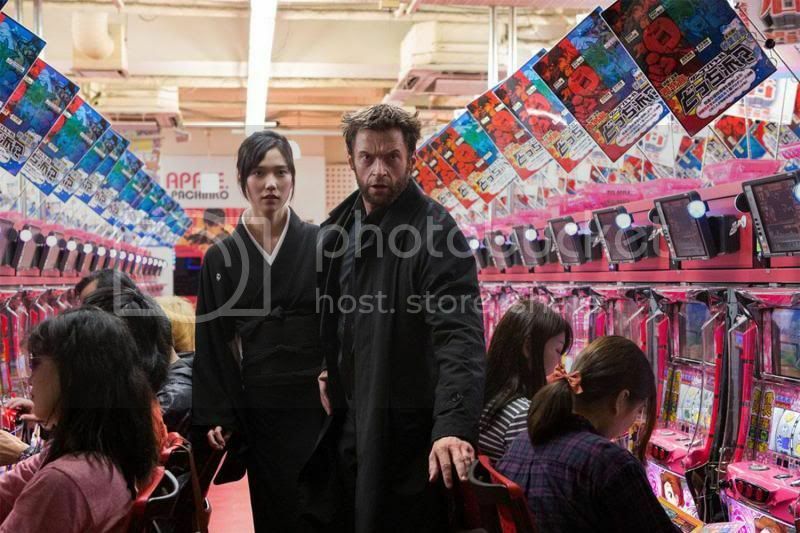 In this wounded state Wolverine loses his powers in modern day Japan and has to fight retrieve them. What I enjoyed about this film was that it focused on Wolverine exclusively, unlike 'Wolverine: Origins.' Directed by James Mangold (3:10 to Yuma, Cop Land), 'The Wolverine' was better than most popcorn movies. It was predictable, but exciting, a tad bit romantic, and most importantly it was enjoyable. It also had some fascinating flashbacks. 'Thor: The Dark World' was a vast improvement over the first 'Thor' film, which I found incredibly boring. You can see that original review here. I even found Natalie Portman (Jane Foster) more tolerable this time. Tom Hiddleston as Loki was of course the highlight, as was Hemsworth. Synopsis: Jane Foster finds a portal to another world: A world of dark elves. The main dark elf is played by Christopher Eccleston, who is unrecognizable in elf makeup. The dark elves are looking for a universe destroying weapon called the "Aether." It's up to Thor and Loki to stop them. Yes, Loki is one of the good guys this time. Or is he? There is quite a bit of action that takes place in Asgard, which was fun to watch. Man of Steel - Overall I enjoyed the film. Again, this was another movie I would classify as a popcorn movie. A movie to be enjoyed and not taken seriously. The effects were well done, albeit OVERDONE. The actors were good for the most part. The story needed some work (ok major work), but it was still decent. Amy Adams was perfectly cast as intrepid reporter, Lois Lane. Amy Adams is perhaps my favorite Lois Lane since Margot Kidder. My biggest complaints about this film have nothing to do with her. Zack Synder - How does one get handed a huge film like 'Man of Steel' after making a dog-faced film like 'Sucker Punch?' Christopher Nolan produced and I'm thankful. Were it not for Nolan, who knows what could have become of Lois Lane. I could see Christopher Nolan's heavy hand throughout the film, but alas it wasn't enough. Clearly Synder needs to be managed. PLEASE KEEP SYNDER AWAY FROM THE WONDER WOMAN FILM. PLEASE. Henry Cavill - Dour, pouty, beautiful Henry Cavill is no Christopher Reeve. I'm sorry to stress this point, but there is something quintessentially American about Superman. Superman is the ultimate American male. Mind you, I'm not saying that a Brit couldn't/shouldn't play an American superhero. For example, Christian Bale was brilliant as Batman. However, Bale has extensive acting (and cultural) experience in the United States. Likewise, I think Gillian Anderson is brilliant in the British productions she's been in (Dickens mini-series and most notably 'The Fall'). Anderson has had extensive experience in the UK (both living and working) and she is bidialectal (meaning she has two different accents). There are some subtle cultural nuances that are difficult to replicate. Given experience, perhaps Cavill will improve. All in all, Cavill was nice to look at, but that does not a Superman make. Storyline or lack thereof - Synder's direction and Cavill's acting weren't the only problems. The beginning of the film was the best part. Once we left Krypton the film quickly descended from there. 'Man of Steel' didn't have the pacing or the storyline that the original 'Superman' film did in 1978. Filmmakers in 1978 couldn't rely on CGI, so they actually had to WRITE. How many buildings can super beings destroy via CGI? Answer: A lot. I got dizzy. Daily Planet - Then there was a key piece missing from Superman's persona, 'The Daily Planet.' In the original 'Superman' film, Clark Kent is a sweet, clumsy, hapless reporter following Lois Lane around by day. At night, he's Superman. Well, in Synder's 'Man of Steel,' you just get Superman and he's not all that super. Part of what made Christopher Reeve's Superman great, was how he portrayed the duality of Superman. Reeve flawlessly captured both the awkwardness of Clark Kent and the elan of Superman. No other actor has been able to do it since. Reeve was also an experienced stage actor. Synopsis: As Krypton is implodes on itself, Jor-El and his wife send their infant son to a galaxy far away with a yellow sun and a blue planet. The film goes through Superman's origins. It's not long before General Zod finds Kal-El and tries to destroy him and his adopted home planet. Even Superman needs a little help from his friends. 'Warm Bodies' has a fresh concept and it's quite funny. At times it's a little hokey and can be a bit teeny-boppish, but overall it's one of the more entertaining films on this list. What I liked most about this movie is that it doesn't take itself too seriously! It's sort of an anti-Twilight film. So yes, I liked it. Synopsis: A zombie falls in love with a real girl and thus starts a transformation to become "real" himself. Unfortunately he falls for the daughter of a military leader charged with eradicating zombies. Wah, Wah. 'Star Trek Into Darkness' - J.J. Abrams has since apologized for the overuse of lens flares and misleading fans about the film's villain. Damon Lindelof has apologized for underwriting Alice Eve's useless character. With all of the apologies, clearly this movie has problems, not including the film's weird titling (no colon :::: what gives?). Yes, this movie was all over the place, but it's J.J. Abrams. So even when he's confusing/irritating the heck of you with a nonsensical film, it's still fun to watch. Yes, Abrams is that good. That said, I'm a trekkie, so I was bound and determined to enjoy this film. Benedict Cumberbatch is a high point. Cumberbatch could literally read the phone book and still be good. The rest of the cast were adequate. Synopsis: The Enterprise crew is back to battle a deadly foe named Khan. I haven't seen 'The Hobbit: The Desolation of Smaug' so I can't really categorize this film yet. Considering the last 'Hobbit' movie was in the "Ok" category, I expect 'Smaug' to be as well, but as I'm not psychic I'm not sure yet. I still don't understand how Peter Jackson and company managed to get three movies out of one book? There is also '47 Ronin.' Without seeing it first I must reserve my judgment, however, Keanu Reeves as a Samurai? Hollywood has lost its ever loving mind. I'm going to preemptively put this in the "Ok" category. Definitely agree with you on Ender's Game and Oz. Admit I did really dig Iron Man 3, Thor The Dark World, Pacific Rim, and Man of Steel. However, the more I think about The Wolverine, the more I dislike that film. I'll probably post a list of favorite movies the first Monday in January. Iron Man 3 was fun, it tried to be more serious than it was. I liked the Wolverine, but the ending was a little lame. I guess I expected more from the Silver Samurai. The best part of Thor was Tom. I think that Christopher Eccleston is a great actor, but he seemed to emotionless and dry. You hit Pacific Rim on the head. Del Toro did the movie as seriously as you can take this genre. I still can't wait for Godzilla! There is a number that I shall watch. Thanks for pointing them out. Great points Ms. Mariah. I read an article about the number of women tweeting about going to see Man of Steel solely based on the attractiveness of Henry Cavill. Kind of sad, but it got the ticket sales up. I think he's a good enough actor, but no one will ever be as honest, pure and dedicated as Christopher Reeve. American or not he took a comic book character and made it real. It's funny to see STID on the OK list, but I can't disagree there. Pacific Rim will be considered a classic sci-fi film one day. Was it just OK? Nay. I saw great. Tom-- I agree w/ you about 'Thor.' Eccleston was either so good or so bad that I didn't even know it was him. I like to think that he was just that good--unrecognizable. Maurice-- Yes, I think Cavill was a big draw for the wrong reasons. Yes, we can agree to disagree about STID. It's on this list b/c I couldn't put it on my best list. IMO it just wasn't one of the best Star Trek's I've seen. It was in the lower half, but it was decent and I enjoyed it! Pacific Rim is Ok on this list b/c it's a popcorn movie. I thought it was a good movie. When I think of the "BEST" movies, I think of potential Oscar/Golden Globe winners. 'Pacific Rim' was so much fun to watch. I really enjoyed it. I share your views towards Snyder - I cannot believe he is allowed to direct anything, let alone a big project like this one. Overall all the superhro movies this year disappointed me with the exception of Thor 2. I thought Henrylicious Cavill was absolute perfect as Supes. He captured the essence of that superhero. Hi msmariah! Thank you for following! Looking at your comments it's pretty easy to see how you found me - lots of friends in common! GREAT synopsis of the year in movies. I haven't seen all of them yet, as we don't GO to movies (damn budgets, damn them). My to be watched list rivals my to be read list...I'm looking forward to coming back later and reading the rest of the parts in these series. Good stuff you got here! Hi Tina, thanks for your comment! Yes, we do have quite a few folks in common. Yes, those budgets are tough! I am a big fan of the $2 theater. I see a lot of second run films b/c I don't like paying full price. Interesting idea for a list! Ender’ Game, I agree the book was a lot better, I just didn’t care about the characters in the same way in the movie. I actually feel Byzantium is above ok, maybe it will gain a reappraisal in the next few years. Or maybe I'll be the lone person championing it LOL! Sati-- I agree w/ you. Synder shouldn't be allowed anywhere near a movie with women in it. Chris-- I liked Byzantium, which is why it's on this list. It just wasn't on my best list. I guess I had high hopes for it. Perhaps my expectations were too high. Katy-- I completely agree. I categorize most of these movies as popcorn films. Like you, I'm not hopeful for the Man of Steel sequel. I don't trust Synder as far as I can throw him. You're right about "Oblivion." Would have been better with almost anybody else. Cruise has two, and only two, expressions: "big toothy boyish grin" and "tooth gritting determination". OK, three if you include "staring into the distance". In general his presence in a movie convinces me not to see it. Imagine my surprise when he was pretty darn good in "Rock of Ages." He might even be able to actually sing. (hard to tell, what with technology and all) But he's mostly only going to get Tom Cruise roles. Disagree about "Byzantium", though. It gets better with multiple viewings, and Ronan's performance is subtle and impressive, especially for her age. (Compare to Kristen Stewart for instance. Nevermind, don't) Watch Ronan's face when she tells the school lady "You're not ready." There's no "acting" happening; she just is 200 years old. Scott-- Thanks for your comment. Yes I agree about Cruise. He needs to stop fighting aliens and start doing more roles like 'Rock of Ages.' He as actually quite good in that movie. I enjoyed 'Byzantium,' I just think it could have been better. Ronan is a great actress. She is miles above Stewart. That scene was a particularly good scene. I thought everyone in the film were great. I guess my major critique of the film would be the main characters lack of traveling. As vampires, wouldn't they travel the world? They could go out during daytime so why would they remain in one country for 200 years, especially if they were on the run?